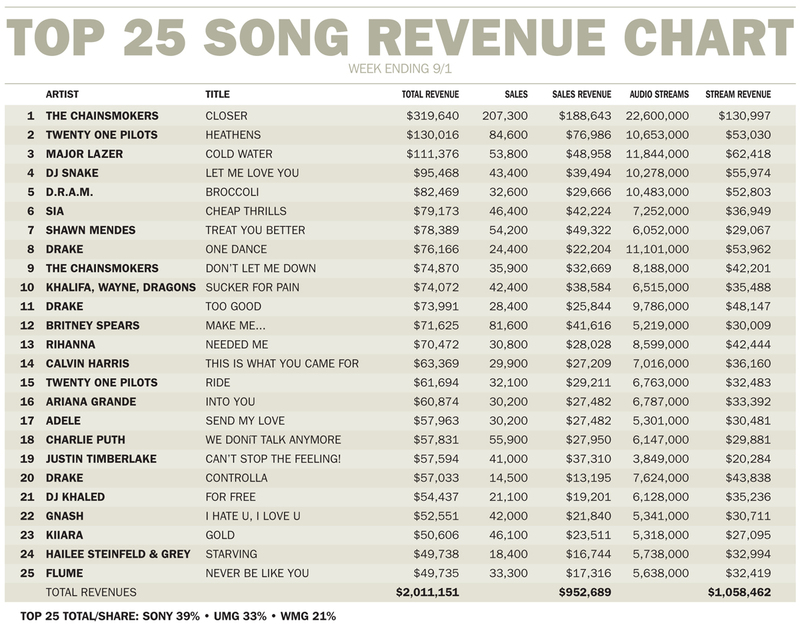 Once more, with feeling: The chart below tracks the total weekly revenue of the Top 25 songs, tabulating sales, streams and revenue contributions. Youll note that Closer by Columbias The Chainsmokers f/Halsey outpaces the next biggest track by nearly 3-1 in total revenue and more than 2-1 in sales and streaming revenue. As the accountants say, smash! A word about methodology: On-demand audio streams are calculated at an average of .00575 per stream; however, streams from the ad-supported tier are calculated at a lower rate. Track sales are calculated at 70% of retail, with 69-cent and other discount sales pricing factored in.